Retrato de Camilo Castrillanca. Imagen: cortesía del autor. Todos los derechos reservados. Social movements in Chile in the post-dictatorship era present an interesting and varied diversity. The Mapuche movement has been, in this scenario, an ever-present actor, which has stood out for its ability to institutionalize much of its political demands (e.g., Acuerdo de Nueva Imperial -1989- [the New Imperial Accord of 1989]; Ley Indígena 1993- [the Indigenous Law of 1993]; Ratificación Convenio 169 OIT -2008 [the Ratification Convention 169 OIT of 2008]). The movement is also notable for their ability to make their demands resonate within the logic of media discourse. For their part, in the last few decades, other important social movements have demonstrated a great capacity for intervening in the national political agenda. Perhaps the most prominent in that sense has been the student movement which, beginning in the year 2006 and with greater force in 2011, was established as a powerhouse of political thought like no other in the country. Equally remarkable is the trajectory of the anti-extractivist movement in the last few years. This movement was set up in the heat of the struggles against Pascua Lama, the red tides in Chiloe, and the Port Project in Punta de Choros. Somewhat closer in time is the emergence of the NO AFP movement and at present, an unavoidable reference is the feminist student movement that, during the first semester of 2018, managed to paralyze both universities and high schools, as a part of an intense fight against the patriarchy, abuse, and gender violence in the Chilean educational system. Up to this point, the solidarity between the Mapuche movement and the other social movements has not been very close. Neither has the ability of Chilean society in general to understand and meet the demands of the indigenous people, or to repudiate the strong state repression on the movement applied from 2000 to the present, been very deep. Repression that includes, by the way, more than a dozen activists killed by security forces. Such are the cases of Alex Lemún, who was murdered at the age of 17 in 2002, while he was occupying land; or Matías Catrileo, murdered at age 23 in 2008, when he also participated in an occupation with other Mapuche community members; just to note some of the most renowned. However, this lack of social articulation seems to be currently reversing. The assassination of the Mapuche community member Camilo Catrillanca on November 14, 2018 became the focus of important examples of solidarity and political support from different sectors of Chilean society and represented a point of rapproachement between various social movements. Likewise, social networks have been plagued with posts and tweets repudiating the case, and the mobilizations sustained for several days in the country’s capital were massive and intense (also intense, of course, was the police repression of these movements). Regarding the case of Catrillanca, Chilean society expressed, through banners and flags, a clear solidarity with the Mapuche cause and a strong rejection of the state violence against these native people. Many pot-banging protests (cacerolazos) were held in downtown Santiago, demanding that the political authorities assume responsibility and contribute to the clarification of the truth and the attainment of justice. Regarding the case of Catrillanca, Chilean society expressed a clear solidarity with the Mapuche cause and a strong rejection of the state violence against these native people. Certainly, the behavior of the Judiciary, the media, and political elites in the face of the situation was quite scandalous. Initially, prosecutors and the media limited themselves to pointing out that Camilo had taken a bullet to his head while driving a tractor in the vicinity of the community of Temucuicui, in Araucanía. They indicated that Camilo was “in the middle of” an operation conducted by the Carabineros to recover three vehicles that had been stolen in the area a few hours prior. The governmental authorities, on the other hand, imprudently gave as definitive the version of the story told by the Carabineros. Although, soon the responsibility for the force used in that case became evident, as well as the disproportionality of the Carabineros’ operation (helicopters, armored tanks, and the deployment of the special “Jungle Command” Carabineros group). It also became public knowledge that a Carabineros official intentionally destroyed the video card that contained the recording of the murder, although recently videos that make the responsibility for the act clear have come to light. Faced with this, the government and police versions began to contradict each other, each entity trying to distance itself from taking responsibility in the case. The Executive branch requested the resignation of the General Director of the Carabineros, Hermes Soto, who refused to resign and forced his dismissal to be enacted through a special Congressional session called specifically for that purpose. Likewise, demands for the Minister of the Interior, Andrés Chadwick, to resign have grown to massive proportions on social networks. Chadwick, demonstrating an almost criminal arrogance, did not refrain from making provocative statements and displaying a lack of respect for the victims’ families. However, these types of actions are not very different from those observed in prior cases of Mapuche murders. Thus, the solidarity offered by different areas of Chilean society for the Mapuche cause deserves to be explained by other factors, perhaps of a deeper and more structural dimension. There is a rapprochement between the demands of the Mapuche movement with the student movement, on the one hand, and with the environmental movement, on the other. We argue that the aforementioned solidarities are the expression of a process of rapprochement between the demands and trajectories of the Mapuche movement with the student movement, on the one hand, and with the environmental movement, on the other. In fact, the 2011 student movement functioned like a connecting channel between the university youth and the Mapuche youth. Although it is an under-investigated topic, there were many Mapuche students who nurtured that epic student movement. From the 1990s on, the weichafe (warrior) figure has become the main character of the Mapuche story, but the sociological profile of that figure has been principally that of a young person (between 17 and 30 years old), male, and, in many cases, is or has been a university student. As such, the young activists of the Mapuche movement have seldom stayed away from the Chilean student mobilization. Indeed, Camilo Carrillanca himself was a dynamic spokesperson during the processes of student mobilization in the Ercilla region during the politicized years of 2011 and 2012. At the same time, thanks to its democratic character and its opening of dialogue, the 2011 student movement generated communication channels with the Mapuche people’s demands. The primary leader of that movement, Camila Vallejo, expressed it thus on many occasions. Even recently, she spoke publicly in her role as a Deputy against the militarization of the Mapuche territory and “the policies of extermination” carried out against the Mapuche people. In this context, it is understood that the university strikes and paralyzations are counted as part of the massive claims over the death of the Mapuche community member. There are cases of these at the Universidad Austral de Valdivia, the Universidad Católica de Temuco, the Universidad de Chile, and the Universidad de la Serena. Deforestation in the Patagonian regions and the scarcity of water led to the Mapuches’ demands taking on a dimension of environmental conservation and fighting for environmental rights. At the same time, within the framework of the expansion of the agroforestry model and the environmental problems generated by the salmon industry, the Mapuche movement has increasingly become a field of resonance for environmental problems. The intense deforestation in the Patagonian regions and the scarcity of water that exotic crops are producing led to the Mapuches’ demands increasingly taking on a dimension of environmental conservation and fighting for environmental rights. For its part, the environmental movement has presented, during the last time, a series of interesting approaches to the reality lived by the people and the Mapuche movement. The recent assassination of the environmental activist Alejandro Castro put this movement in front of a particularly similar situation – although different – that the Mapuche movement has been facing for some time. To understand these questions in greater detail, we will do a quick review of the trajectory of the Mapuche movement during the last few decades, as well as its relationships with the state and capital. In 1977, the Chilean dictatorship enacted Decree 701, aimed at promoting the development of the forest industry. Today this industry maintains billing levels that represent about 2.5% of the national GDP. It does so, however, at the cost of appropriating huge territorial extensions, expelling communities, destroying the ecosystems and native forests, and using huge amounts of water, leaving the people with serious problems with access to water. Only two businesses – Forestal Arauco and Mininco S.A. – are owners of 2 million hectares, mainly concentrated in the historical Mapuche territory, in the south of Chile. As the Mapuche historian Fernando Pairican points out, during the nineties, the growth of exotic forests (eucalyptus and pines) occurred in parallel with the growth of militant youth and a Mapuche organization aware of the importance of their struggles and the defense of their territories. In that climate, a radicalized militancy emerged that did not refrain from resorting to the burning of crops and forestry trucks as a way to expel companies from their territories. Historically, governments have chosen to interpret the Mapuche demand as a "threat" to public order and, consequently, as a security problem. Far from understanding the Mapuche demand as a legitimate claim, a human right, and a historically-rooted demand in response to the expropriations and the violence that the Chilean state has perpetrated on that people during the euphemistically denominated "pacification of the Araucanía", the governments of the Concertación and the last governments of Michelle Bachelet and Sebastián Piñera have chosen to interpret that demand as a "threat" to public order and, consequently, as a security problem. The business world and the Chilean state quickly understood that this hindered the possibilities for capital reproduction and, as a result, resorted to repression, vigilance, prosecution, and even criminalization of social protest. The government has insistently made use of anti-terrorism legislation (also bequeathed by the dictatorship) to address actions that are not only political acts, rather than criminal acts, but also are not part of this legal classification, because they are not intended to generate fear. Thus, the Chilean state has used the social conflict generated within the framework of the dispossession of the Mapuche people to produce a discourse akin to the doctrine of "new threats" promoted by the Pentagon: a military, governmental, and security logic aimed at constructing enemies as diffuse as they are unreal (terrorists, narco-terrorism, organized crime) but which, nevertheless, while they are presented as imminent dangers to "national security," justify the growing militarization of civic life. In this context, for the last two decades, violent and intimidating raids on the communities have been carried out continuously and systematically, fixed checkpoints and surveillance have been implemented throughout the Araucanía region, and they have even mounted Intelligence services operations and have made accusations that end in outrageous episodes of implantation of false evidence (e.g., The recent Operation Huracán and Operation Andes). The result of this dynamic has been the arrest (many times without reliable evidence) of activists and in reference to the Mapuche movement, the assassination of various community members and the disappearance of many others. In most cases, it involves young people, men, and active defenders of the cause of their people. 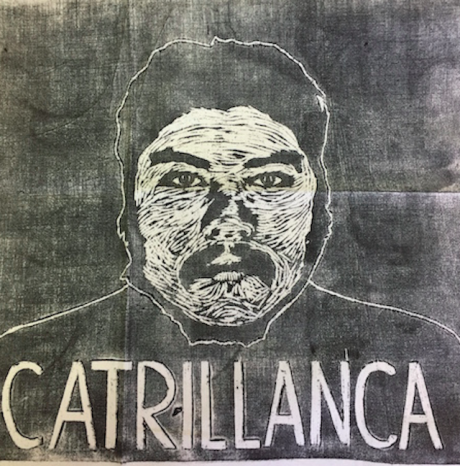 It is in this historical trajectory that the referenced murder of Camilo Catrillanca is framed; and it is in this context that the aforementioned converges with the emerging environmental movement. In fact, in mid-2018, news about the extremely high levels of pollution reached in the communities of Quintero and Puchuncaví, located about 150 kilometers northwest of Santiago, emerged with force in the media. The Ventanas Complex is concentrated there, a dense industrial node that has turned the region into a truly sacrificial zone. A study carried out by the Environmental Department of the Medical College, showed that the inhabitants of the area are exposed to different toxic substances such as nitrobenzene, methyl chloroform (trichloroethane), nitrobenzene, toluene, and isobutane. The contact with these substances increases the risk of developing different types of cancer, such as bronchopulmonary, bladder, renal, urinary tract, liver, or skin, as well as the risk of myocardial infarction and cerebrovascular accidents. The anti-extractivist and local movement strongly raised its voice against these violations of citizens' environmental rights. Powers as strong as they are dark let their effects be seen. On October 4, 2018, in the vicinity of Valparaíso, the fisherman, union leader, and leader of the protests in Quintero, Alejandro Castro, was hanged. His death has not yet been explained. In the first days of November, a number of social-environmental organizations from the municipalities in the Valparaíso region – among which the Cabildo Abierto Quintero-Puchuncaví was particularly notable, called for a mobilization for the 15th of that month, under the slogan, "No more sacrificial zones. May the territories rise up and exercise sovereignty." The objective of the mobilization was to demand the recovery of the territory and to stop contaminating mega-projects, such as environmental exploitation initiatives, but it also adopted some of the demands of the Mapuche movement. Even so, the murder of Camilo Catrillanca on the 14th changed the scenario. From there, the originally scheduled mobilization took on, with much greater force, the claims against the militarization of the Araucanía region and the demands for an end to the violence and criminalization of the Mapuche people, granting them equal or greater importance than the claims against pollution in Quintero and Puchuncavi. According to the declarations of the Cabildo Abierto Quintero-Puchuncaví, its leaders made the necessary arrangements so that "the mobilization was of a peaceful and family nature," but Santiago’s City Hall denied the permit and, therefore, the crowd that gathered at six thirty in the afternoon in Plaza Italia could not march. Police repression, using tear gas and “guanacos,” began in the first hour of the mobilization. Many demonstrators ran through Bustamante Park and barricaded the surrounding streets. 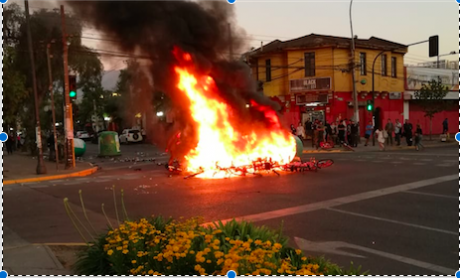 Bicycles rented for public use and a Transantiago bus were set on fire. Hundreds of people came out to show their discomfort in the face of impunity for the murder of Camilo Catrillanca. A burning barricade set by protesters aganist the handling of Casmilo Castrillanca's case. Image: courtesy of the author. All rights reserved. Many wore Mapuche costumes, others carried flags. Most were young, but there were also older adults and children. Thus, the student, environmental, and Mapuche social mobilizations seem to be converging in the present, generating an expansive effect on the whole of Chilean society. Faced with this scenario, we argue that this is a moment of cleavage in the history of the social movements of Chilean society. A time in which, finally, the different struggles that these people have been constructing and rebuilding continuously, throughout the almost three decades that have passed since the end of the dictatorship, seem to be synergistically articulated. Solidarities and political support are as much needed by the Mapuche movement as by society in general. In the end, it would seem that the Mapuche people's historical demands are beginning to be understood by a society that until very recently was unable to listen to the cries of the Mapuche people; mounted, not infrequently, on the reproduction of fallacies by the governmental and the media, about the terrorist characteristics of that activism. In short, these solidarities and political support are as much needed by the Mapuche movement as by society in general that, without a wide range of alliances, found it difficult to overcome the authoritarian, neoliberal, and individualist enclaves that the almost twenty years of dictatorship bequeathed to them. The water trucks used by the police to disperse demonstrators during protests are known by this name.